Mini-Q40 MK2 is a compact and reliable dive light with performance you've never seen from a light this small. 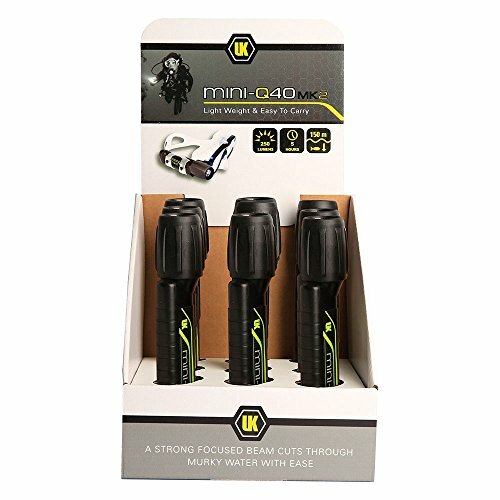 Equipped with a convenient push-button switch that's easy to use even with heavy gloves on, the Mini-Q40 MK2 can produce 250 lumens for 5 hours of run time. Running on four standard AA batteries, it's always easy to keep the light running, no matter where you are. Perfect for travel and those long dive trips, the light only weights 6 oz, measures 7.5" in length, and is easy to pack due to its small size. A strong focused beam cuts through murky water with ease and lights up any dive, day or night.